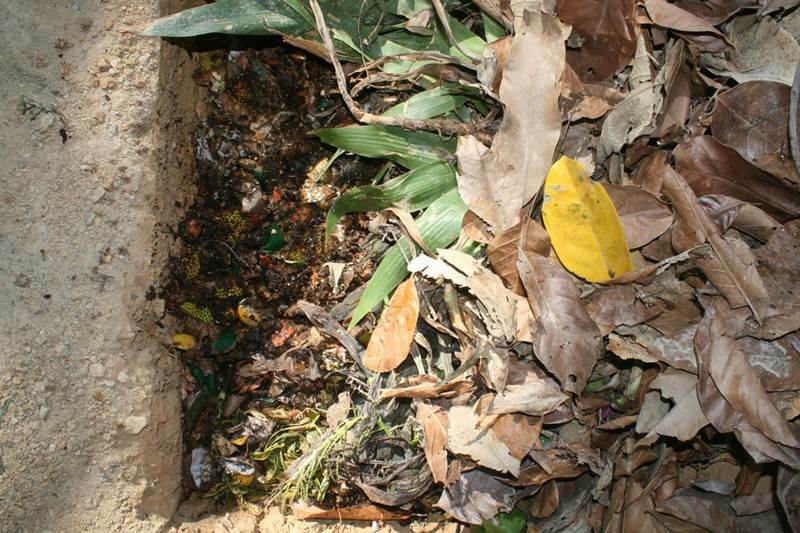 PHUKET: If you’ve ever thrown a banana peel in the yard or buried a pet, you’ve already started composting, which is actually nothing more than letting things decay the natural way. Starting a compost pile is just as easy. Sticking to the routine is where it can get difficult, but if you’ve made up your mind to compost I’ll share with you some things I’ve learned along the way. I like to keep things simple and inexpensive. I skip the whole compost bin altogether, while others prefer up to a three bin system. For this article, I’ll take the poor man’s approach, which is pretty much just making a pile in the yard. 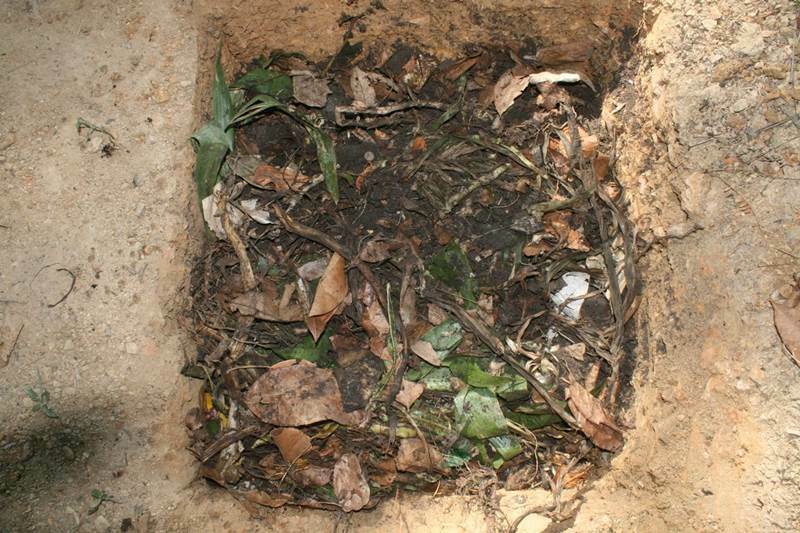 If containing or hiding your compost is important, there are plenty of ideas on the internet. One idea I wouldn’t mind trying would be using four wooden pallets, but unless you’re composting large amounts, a simple pile should be the best way to start. To get started, all you need is a bucket (with a lid), a shovel and some land (Pic 1). The bucket is for the kitchen and the shovel is for the compost pile, which will be outside. Whenever you prepare a meal or clean out the fridge, throw your scraps into the bucket and use the lid. This will keep the gnats and flies away. Empty the bucket often and rinse it out before using it again. If you regularly empty the bucket you shouldn’t be surprised with any foul smells from the decomposing veggies. If you happen to forget about your compost bucket and you’re knocked back by the smell when you remove the lid, just turn your head as you re-lid the bucket and head off to the compost pile. If you don’t smell anything, there’s no need to go in for a closer inspection. Asking your friends or significant other, “Does this smell bad?” is usually not wise. Some noses are more sensitive than others. If you see small bugs in your bucket, don’t panic. It’s natural and all part of the composting process. And please, never use pesticides in or around your compost. Don’t kill the bugs, they’re just doing their job. The simple answer is anything organic like kitchen scraps, coffee grinds, tea bags and napkins. Other items include newspapers, cardboard, grass cutting, leaves, dead plants with the soil, nail clippings, rubber bands, bank slips, dust bunnies, most stuff you sweep up or vacuum, hair from the drain, egg shells, wine corks, toothpicks, twigs, feathers, all kinds of hair (even from the shower drain) and pure latex products. 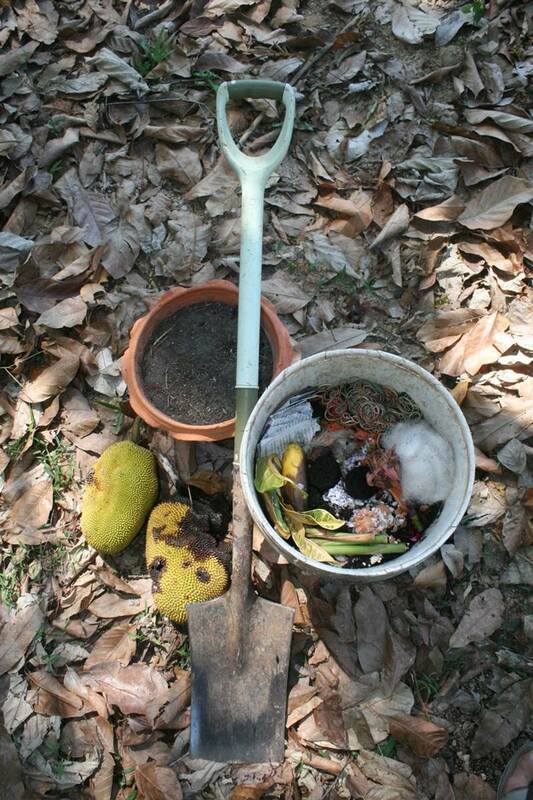 The more you compost, the more you’ll start adding to your compost list. There are exceptions. You shouldn’t compost oil, dairy, animal products or animal waste. That’s not to say they won’t decompose, but they will attract unwanted bacteria, pests and vermin to your compost as well as create foul smells – not good if you live in a community weary of your compost venture. Walnut shells and treated wood are also a no go because they can be toxic. Invasive weeds should be avoided as they tend to pop up when you use your compost in the garden. It should also go without saying, but please don’t compost chemicals, liquid soap, bleach or other chemical based liquids. What about rocks, plastic, glass, metal, motor oil and H2SO4? All are “No”. For this article I’ve started a new compost and documented each step of the way. You might want to prepare your area before you start collecting your kitchen scraps because let’s face it, digging the hole or building a bin is much harder than dumping your compost into it. Note: You do not have to dig a hole to compost. This is just my approach. You can always compost on flat land. I like the hole because so far I’ve never had any surprises during or after a heavy rain. 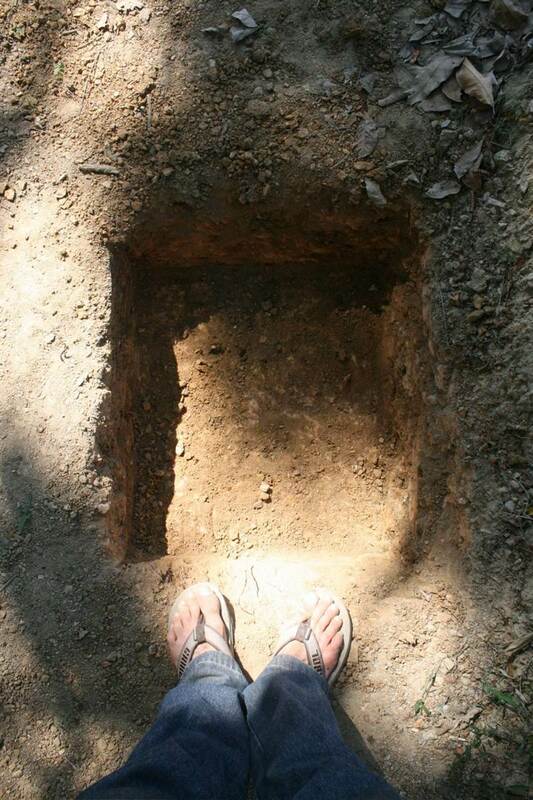 Pick a spot in the yard and dig a 10 to 20 cm hole, 50 cm by 50 cm (Pic 2). If that doesn’t take too much effort, think about making it a bit wider. There’s no limit to how big you can start out. Once the hole is dug, dump in your compost. You may want to give any big scraps a few chops with the shovel to speed up the compost process, but it’s not essential. Next you throw on some leaves or grass cuttings (Pic 3). Mix that together and if you’ve got some old potting soil with a dead or dying plant, throw that in as well. Mix it all once more and then cover it with leaves or grass cuttings (Pic 4). Finally, moisten your new heap with some water. The next time your compost bucket gets full, just empty the contents on top of the heap and cover it with some more grass cuttings or leaves. This is called layering. Once a month you should go out and turn the pile. This is where you get your shovel and mix things up. Don’t worry if you still see recognisable food scraps or paper. Just give your heap some time. Eventually they’ll break down and more than likely sooner than you think. You’ll know your compost heap is working well when you can feel heat when placing your hand on top of the pile. Kitchen scraps are called greens and make up the fuel of the compost. 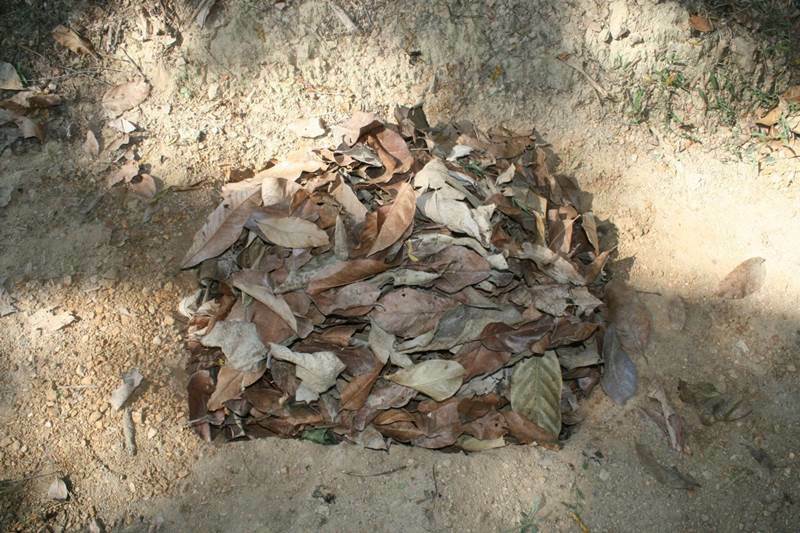 Grass cuttings and leaves are called browns and make up the spark of the pile. Together, greens and browns create a reaction which fuels to composting heat. Composting only greens can create a smelly pile, while composting only browns can actually start a nice smouldering fire on the inside (if the pile is big enough). 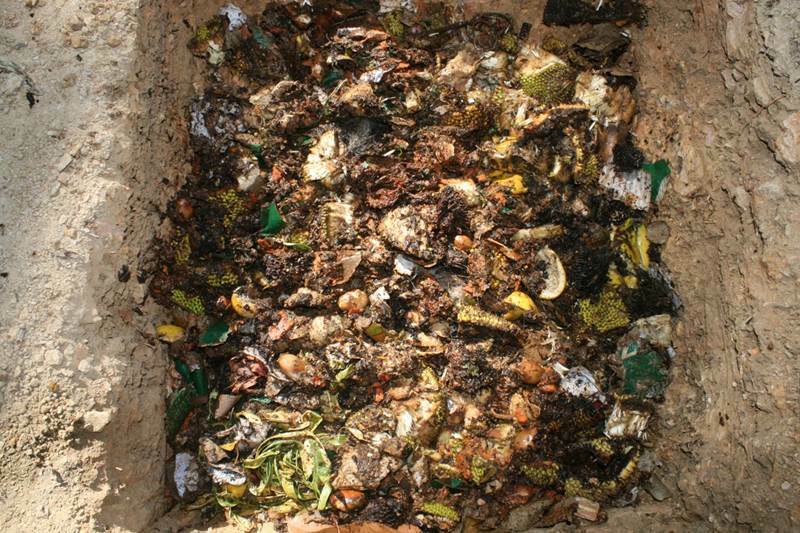 Composting browns and greens together will stop any foul odours and fires from ruining your compost experience. On a final tip, when you compost egg shells give them a quick rinse before adding them to the compost bucket. This will dramatically cut down bad odours. If you happen to let eggs go bad and decide to compost them, take the bucket outside that day and add the contents to the bottom of the pile.